It’s winter and time to huddle around the Heatilator. Here’s how to make sure it’s ready. Winter is here! It’s that time of year when kids of all ages are sledding down snowy hills and skating around in circles – followed by gathering together around the Heatilator to warm up. Gas fireplaces require very little maintenance, but there are a few things you can do to make sure yours is ready for the season. You’ll enjoy the fire more if the glass is clean. Here’s how to clean it. Remove the front face the fireplace, and then carefully remove the glass assembly (follow instructions in owner’s manual). Lay them on a soft surface. When finished, put the glass and front back on the fireplace. When the front glass is off (see above), remove any dirt or dust using a soft paint brush and a vacuum. Check the inside of your gas fireplace or stove for any damage, such as rust or flaking. Call a hearth dealer if you think you might need service or replacement parts. Put your feet up, fire up with the remote and enjoy the fire! Don’t have a gas fireplace? You can add one to your home. 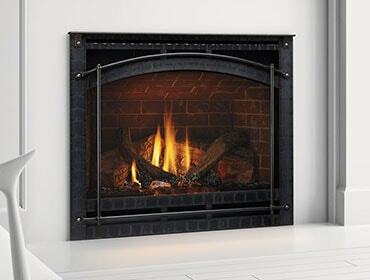 Check out the many styles and options for gas fireplaces here.